Summer Place is a North Myrtle Beach resort in the Cherry Grove section of North Myrtle Beach, South Carolina. 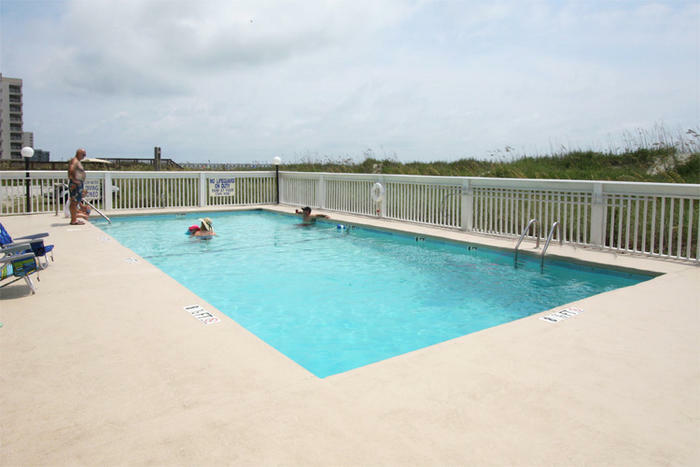 These two-bedroom two-bath North Myrtle Beach condominium rentals are beautiful and spacious inside. A comfortable living room is a great place for family conversation, while the dining table is good for eating meals and playing games. The full kitchen makes preparing breakfast, lunch and dinner easy, though North Myrtle Beach, South Carolina has delicious seafood at every turn. A private backyard is a relaxing place to spend some quiet time, but with the ocean just downstairs you may be more inclined to regularly visit the white, sandy beaches on which you can play all afternoon. The Summer Place North Myrtle Beach resort is full of personality and every day of your North Myrtle Beach vacation will be exceptional when you retreat each evening to the comfort of Summer Place. A tranquil setting with warm coastal breezes, Summer Place is well suited for families looking for some relaxation. And if you prefer the fun and excitement that North Myrtle Beach, South Carolina offers, you are only minutes away from it all. What is your fancy? Do you want a live dinner theatre where you eat in a lagoon setting where pirates take center stage? How about chartering a deep-sea fishing boat and spending the day reeling in the catch of your life? Tandem parasail rides are up and down the North Myrtle Beach coast where you soar high in the sky while a speed boat pulls your parachute—you will have to take off and land on the boat. Rent a Sea Doo and brave the ocean waves on a course that will leave you soaked and exhilarated. All the North Myrtle Beach family attractions and amusements you want to do are within easy reach from Summer Place and yet these North Myrtle Beach accommodations are nestled in a quiet neighborhood where you can rest easy. Elliott Beach Rentals is not affiliated with onsite management or the HOA of Summer Place.